Even though the Apple App Store is four times more profitable than Google Play, iOS can't match Android's revenue growth of 311 percent since January and 17.9 percent in the last month. In contrast, Apple's app revenue has increased only 12.9 percent this year and shrunk 0.7 percent in the last month. The numbers come from a report published by app store analytics firm, App Annie, which also dishes some stats concerning how the pair square off in free app downloads. Apple still leads Google Play with 10 percent more volume of global free apps downloaded. But once again, Google Play's growth impresses at 48 percent in the last five months, compared to a 3.3 percent growth for Apple in the free app market. "The gap between global revenue on iOS and Google Play is still there," said Bertrand Schmitt, App Annie CEO, in a press release about the report. "But the gap is shrinking every month, creating more opportunities for publishers to generate significant revenue growth in several countries on Google Play." Though Google Play is the new app store on the block, it has been growing rapidly since it ditched the Android Market name back in March. After that, Google started selling apps, games, books, music and movies under the Play brand and has been steadily adding new features and partners. Since its debut, the Google Play store has put a few notches on the wall as well. In September, it hit the 25 billion downloads millstone. And in October, Google Play offered 700,000 app for download, matching the number of apps available for iOS. But the numbers jump may have more to do with the popularity of Android rather than Google Play's facelift. The Android OS has been taking sizable bites out of Apple's tablet market share recently. In October, iOS control of the tablet market dropped to 50.4 percent, which was about even with Android. Each operating system also shipped about 14 million tablets in the third quarter of 2012, according to IDC. "Although, in the most recent month, growth has slowed considerably, and the question remains, can Google Play keep growing at a lightning pace?" the App Annie report read. And that is the question going forward. It seems that Apple has hit its market saturation, as Android and Google Play still have room to grow. 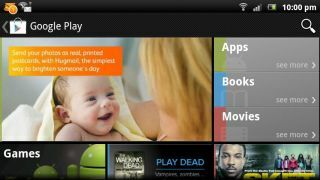 One analyst thinks Android will gain the upper hand sometime in mid-2013, and gain control of the tablet market. If Android can sustain growth at the pace it has been, it could very well match or even surpass Apple's market share. With Google's Nexus 10 and Amazon's 7-inch Kindle Fire HD challenging the newly released iPad and iPad mini, this holiday seasons should be a good glimpse of how the Android vs. iOS battle will play out.